Ownership / Access: Finnish state. Museum. Notes: Turku Castle (Finnish: Turun linna, Swedish: Abo slott) is a medieval building in the city of Turku in Finland. 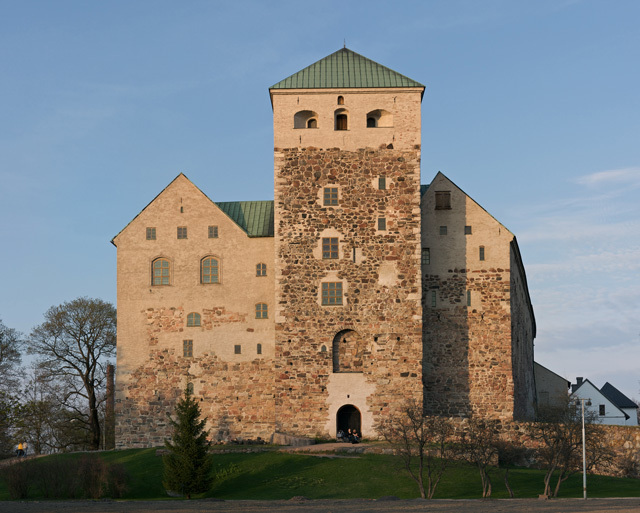 Together with Turku Cathedral, the castle is one of the oldest buildings still in use in Finland. Turku Castle is the largest surviving medieval building in Finland. It was founded in the late 13th century and stands on the banks of the Aura River. The castle was the center of the historical province of Finland Proper, and the administrative center of all of Finland. Its strong walls and dungeons also served as the state prison for centuries; even today, a prison is colloquially referred to as linna (castle) in Finnish. The castle has been the place of many historical events; in 1573-1579, for example, the deposed Swedish queen Karin Mansdotter was kept prisoner here. The castle is Finland's most visited museum, with attendance reaching 200,000 in some years. In addition, many of the larger rooms are used for municipal functions.